As corralling health care costs remains elusive on a large scale, many bright people in the industry are working on ways to trim excess fat wherever possible. For example, wouldn't it be wonderful if there were an EMR-agnostic tool that could prompt physicians to evaluate their ordering decisions, helping them to reel in treatment costs and improve care? The folks at the Texas Hospital Association (THA) teamed with IllumiCare to create the Smart Ribbon, a nonintrusive "ribbon" of information that hovers in the EMR and provides physicians with real-time patient-specific hospital costs and iatrogenic-risk data. The technology has been a smash hit, posting impressive results and earning kudos from various organizations, including the College of Healthcare Information Management Executives (CHIME), which bestowed its 2017 Innovator of the Year Award to Fernando Martinez, PhD, chief digital officer at THA and president and CEO of the THA Foundation (THAF). In an interview with Martinez, For The Record (FTR) dug into the technology's promise. FTR: How did the idea for Smart Ribbon emerge? FM: THA became aware of a three-person group who had developed an EMR-agnostic technology for providing cost data to providers at the point of care. This piqued our interest because of the overwhelming peer-reviewed published studies that corroborate that increasing awareness of cost at the point of care leads to a reduction of cost and cost variability. The [Elisabeth Rosenthal] book An American Sickness: How Healthcare Became Big Business and How You Can Take It Back describes doctors' cost awareness as the first step in the process of delivering value-based care and explains the importance of doctors learning and having far more access to medical pricing. In training, doctors are taught little to nothing about the cost of health care. This ignorance has profound implications for their future practice and us (all patients). After an initial review of the technology architecture and design, THA started working with the group to produce a THA-branded version of the tool—the THA Smart Ribbon. The product was not in use anywhere at that point [and was] largely conceptual. FTR: Was there a moment when you knew you were really on to something? FM: The peer-reviewed evidence supporting this technology approach is very convincing. Based on publicly available CMS (Centers for Medicare & Medicaid Services) cost-per-discharge data, THA identified multiple hospitals in Texas with an average cost per discharge above the state and national averages. We realized we could help our member hospitals bring those costs under control. But we knew for certain we were really on to something after the first hospital adopted the solution. Parkland Health and Hospital System was the first leader hospital to install the THA Smart Ribbon in Texas. Parkland engaged in a rigorous pilot study to compare physicians who used the THA Smart Ribbon against their historical behavior and then vs nonuser Parkland physicians as a control group. While using the THA Smart Ribbon, just 55 pilot cohort providers in 71 days produced savings of $430,444 (Medication: $304,274, Laboratory: $67,901, Radiology: $58,269). FTR: How did you test the solution? FM: The idea was to start with early adopter hospitals/systems/partners where the value is proven, and champions developed. THAF and IllumiCare created an early adopter incentive opportunity for Texas hospitals and health care systems to demonstrate the ease of installation, provider adoption, and reduction of costs made possible with THAF Smart Ribbon. These leader hospitals will receive positive community recognition, favorable investment pricing, evidence of clinical efficacy, and input in future development opportunities. Their experience and results will propel wider adoption in Texas and the full realization of potential benefits. The primary goal with early adopter hospitals is to demonstrate a reduction in the cost of medications, labs, and radiological tests per admission, with the length of stay, mortality, and readmissions held constant or improving. The data collected about provider usage and risk-adjusted costs per admission will allow for measurement of aggregate changes pre- and postintervention, using a direct adjustment method to adjust risk by all APR DRGs [patient refined diagnosis-related groups]. We can then compare what the cost would have been before the intervention period vs what the costs are in the postintervention period, APR DRG risk-adjusted. That number would then be compared with the technology cost so that a business decision about its value can be made. FTR: Were there certain physicians whom you thought would better serve as guinea pigs, so to speak? FM: That decision was left up to the hospitals, but in today's hospitals, a physician specialty called hospitalists are responsible for a majority of the care inpatients receive, so it makes sense to include them in the first wave of adoption. FTR: Were there physician champions? FM: Yes, typically chief medical officers or chief medical information officers are very instrumental in developing leaders within the physician staff. FTR: Describe the process of obtaining C-suite approval to implement the tool. FM: Everything is built on a fact-based value proposition. Economics is the key element to gaining executive interest and ultimately support. We would provide information [similar to below] tailored to each hospital or network. We address four major consideration components: issue, opportunity, specific solution, and evidence of credibility. FTR: Interesting. Could you take us through each component? Issue: Currently, medical care in the United States is characterized by widespread overuse, which leads to countless direct and indirect harms to the patient. Confronting such a large problem will require the efforts of individual clinicians as well as systemic transformations. Overutilization of health care has significant human and economic costs. Current estimates for unnecessary expenditures on overuse range from 10% to 30% of total health care spending. Even the lower estimate, from the Institute of Medicine, amounts to nearly $300 billion a year in the United States. Opportunity: Many studies have demonstrated that overutilization can be curbed by presenting cost and patient safety data to providers at the point of care. THA Smart Ribbon does exactly this—presents the human and financial costs of care to the physician at the point he or she is making decisions about tests and bloodwork to order and medications to prescribe. For example, in addition to costs associated with radiology tests, the physician will also see the patient's cumulative medical radiation exposure and associated cancer risk. Physician orders control 87% of hospital expenses. However, [providers] know very little about the cost of each item they order. Many studies have proven that informing physicians about treatment costs and/or risk of patient harm at the time and place they are about to order the next test or medication causes them to order fewer and less expensive tests and medications. Specific solution: The THA Smart Ribbon transforms the way physicians see key patient data, getting insight that can reduce redundant tests and medications. At the same time, the tool provides readily available information that can affect quality and patient safety. [It] arms hospitals with one of the most influential tools possible to increase transparency and awareness for physicians without invasive and duplicative steps. The THA Smart Ribbon combines existing clinical data, financial data, and patient safety indicators to reveal patient-specific economic and clinical safety metrics while physicians are in the ordering process. Evidence of credibility: We have already taken a large first step in demonstrating success by encouraging key hospitals to self-adopt and fund the deployment of THA Smart Ribbon. Current leader hospitals include Parkland Health and Hospital in Dallas, Covenant Health System in Lubbock, and Doctors Hospital at Renaissance in Edinburg. Parkland is the first to deploy the solution and has reported savings of more than $127 per admission at a technology cost of $10 per admission. The other hospitals are in various stages of implementation. Parkland's cost savings are not just about saving the hospital money. This per-admission saving means the patient at the core of the hospital's mission is not receiving unnecessary procedures, bloodwork, or medications that could lead to complications, infections, or blood loss. In short, the patient is safer and getting more appropriate treatment in large part because of THA Smart Ribbon. If this is one example of the impact of this tool in one hospital, on a statewide scale Texas hospitals could save $22.8 million per month by reducing only $127 per admission as demonstrated at Parkland. The economic benefit to hospitals participating in this program and the Texas community is significant. The ultimate result from this project will be patients and hospitals will save money and, more importantly, patients will be exposed to less radiation, fewer lab tests, fewer procedures, and fewer medications. Inherently this will mean that patients will have more money in their pockets and be less likely to have experienced risks or complications from unnecessary or expensive procedures. These ancillary benefits such as a healthier population and money saved for the patient and his or her family are significant but not captured in this analysis. FTR: In terms of the technology itself, were there hiccups? If so, how did you overcome them? FM: Solving the ability to display contextual information—physician and patient—without direct integration into the EMR was a significant technological challenge but necessary to efficiently deploy an EMR-agnostic solution. It was developed with the input from many hospital CIOs. FTR: What has been the reaction of physicians? FM: Overwhelmingly positive and supportive. THAF's preliminary feedback from physicians who have seen or used THA Smart Ribbon has been very positive, and it is clear that physicians want this information associated with treatment options. For example, a gastroenterologist said the cumulative radiation tracker is the first meaningful and significant effort to curb frivolous ordering of CT scans. He discusses the approximate radiation exposure per scan with the patient due to Smart Ribbon and documents this discussion in the chart before ordering a scan. The association of a cancer risk with every CT scan has made him think harder before a CT scan, especially in women. One doctor stated that a patient of his noticed the THA Smart Ribbon tool was up on his outpatient EMR because he looked up drug prices in a comparison. He asked the physician how he knows the prices and he showed him. The patient was very appreciative that his doctor looked at drug costs when considering an Rx. FTR: How did you get around any interoperability concerns? FM: The lack of system interoperability is one of the most vexing issues in health care technology. A handful of dominant EMR companies control the screen and squeeze out other innovation. The THA Smart Ribbon powered by IllumiCare breaks this stranglehold by allowing hospitals to display any data at the point of care. The THA Smart Ribbon is EMR agnostic, which abstracts the solution away from the EMR, thereby easing the burden of managing long term. Once the HL7 communications are in place, the interoperability of the Smart Ribbon and the EMR is durable and low maintenance. EMR version upgrades and patches can be made without the burden of additional testing or modification, a significant benefit to IT teams. It solves the problem of care delivery across disparate providers, which is critical to patient outcomes and managing avoidable orders and spending. This new technology is a patent-pending nonintrusive ribbon of information that hovers over a hospital's EMR and gives physicians and other care team members real-time patient-specific information about the patient concurrently being viewed in the EMR. No separate login is required, and when the user looks at a new patient's record in the EMR, THA Smart Ribbon automatically refreshes to display the data for the new patient. If users do not interact with the display after a number of seconds, it minimizes into a microribbon that renders it unobtrusive in the clinical workflow. FTR: What are the benefits of the THA Smart Ribbon? FM: Multiple. The two major benefits that were identified in the CHIME recognition are reduction in avoidable spending and reduction in cost variability. 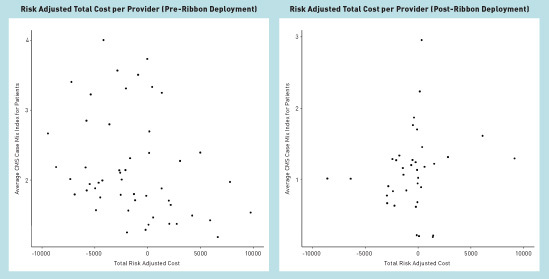 By presenting costs with risks in the EMR in real time using the THA Smart Ribbon, Parkland achieved significant financial savings but also decreased clinical variation promoting high reliability. The decrease was physician driven; leadership never urged or promoted this behavior. The only training provided was a four-minute video that was watched by a few caregivers. FTR: I understand a study was conducted this past summer. What were its findings? FTR: What's next for Smart Ribbon? FM: THAF is aggressively encouraging hospital participation while pursuing methods to assist hospitals in their rapid investigation and adoption of proven technologies. The goal is to have Texas hospitals that represent greater than 90% of Texas discharges participating. The economic benefit to hospitals participating and the Texas community is significant. A conservative estimate of a 4%—$63.21 savings per discharge—cost reduction or the Parkland Health and Hospital System results of $127.61 per discharge would save Texas hospitals between $397 million and $798 million on an annual investment of $20 million. The current primary focus is the "inpatient smart ribbon" but we hope to soon include an "ER smart ribbon" and an "outpatient smart ribbon." 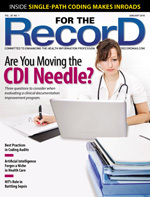 FTR: How do you believe EHR usability can be further improved? FM: US health care cannot operate with a business-as-usual attitude. It is too important that innovation occurs with rapid evaluation and proven solution adoption across our hospitals. The creation of the THA Foundation Center for Technology Innovation is a next step in protecting and enhancing Texas's health care. The THA Smart Ribbon was an early EHR-enhancing technology solution that was worthy of vetting. This project will result in information exchange and adoption of technology that is already starting to affect health care delivery in Texas and across the country. FTR: Do you have any technology projects in the pipeline? FM: We are always looking to help our member hospitals with technology that is applied with pinpoint precision. • Implement a Smart Ribbon technology in at least 130 hospitals across the state that will enable physicians to view important information about both cost and risk to the patient at the time of ordering tests and medications to reduce unnecessary and/or redundant procedures and prescriptions. • Design, build, and implement a statewide master patient ID to allow hospitals to get a better picture of the health care needs of the patient. • Compile and evaluate statewide population health analytics results that will help physicians, nurses, and other hospital staff make the most informed and effective patient care decisions.